Originally posted: July 16, 2018 . Last modified: December 29, 2018 . A flavorful Instant Pot chicken taco soup made with black beans, chicken breast, corn, garlic, onions, and cheddar cheese. It’s perfect for Fiesta Fridays! We have yet another Tex-Mex themed dish that we’d love to share with you. 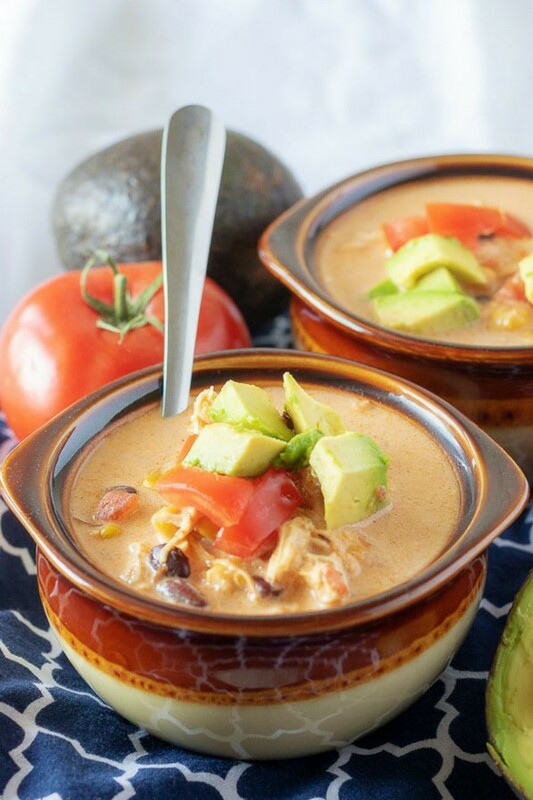 It’s our Instant Pot chicken taco soup and in case you’re wondering it can be made without using an Instant Pot. I will get into those details in Tips section on the post. For now, let’s just focus on this simple and delicious recipe as it stands. While it’s not exactly “soup season,” it’s always a good time to share a Fiesta Friday offering. This one features chicken breast, Southwest seasonings, and cheese. How can you go wrong with a combination like that? Best of all, it’s pretty easy to make and it uses everyone’s favorite kitchen tool, the Instant Pot. The Instant Pot is great for soups. In fact, it’s one of our favorite ways to make soup. That’s how we made our Wild Rice and Mushroom Soup, Cream of Tomato Soup, and Corn Chowder with Bacon to name of few. First, go ahead prep as many of the ingredients as possible. You know, dice the onions, open the canned veggies, drain and rinse the black beans. You get the idea. Once that’s been done, turn your Instant Pot to “Saute,” and add vegetable oil. Next add the onions, and stir until soft (about 2-3 minutes). Add the garlic and cook another 30 seconds, then turn off the Instant Pot. With the onions and garlic completed, it’s time to get down to business. 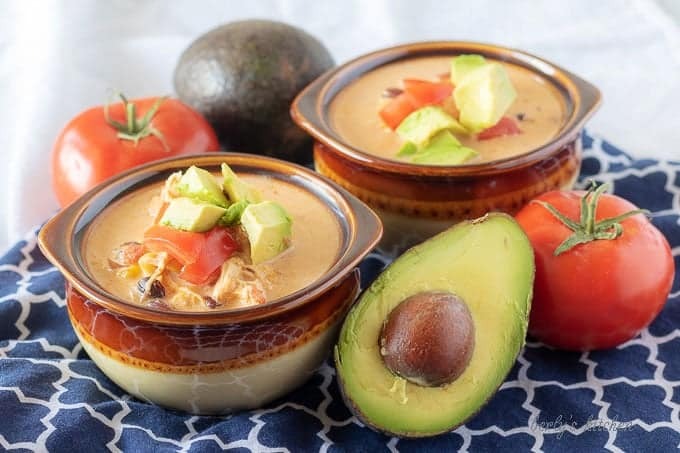 Layer the chicken, taco seasoning, chicken broth, corn, beans, and tomatoes with green chiles into your Instant Pot. If needed, give everything a good stir because you want to make sure all the liquid gets to the bottom of the pressure cooker to avoid any issues. After all the ingredients have been loaded, close the lid, and set the Instant Pot to “Sealing.” Turn on the Instant Pot using the manual/pressure cook setting on high pressure for 7 minutes. When the 7 minutes are up, allow the Instant Pot to complete a natural release for 10 minutes and open the valve for a quick release of the remaining pressure. This will keep the meat tender and juicy. Remove the lid and take the chicken out of the Instant Pot. You can use tongs or two forks to shred the chicken. Set the meat aside so you can add it back in later. Now, turn the off the Instant Pot and slowly add the heavy cream. It wouldn’t hurt to let the soup sit for a few minutes before adding the cream. The last thing you want is for the soup to break. When you’re ready, add the heavy cream and stir it to combine. Then turn the Instant Pot back on to the “Keep Warm,” setting. Add the shredded cheese and stir everything until the cheese is melted. Last, place the shredded chicken back in the Instant Pot and stir the soup once more. It’s now ready to serve. 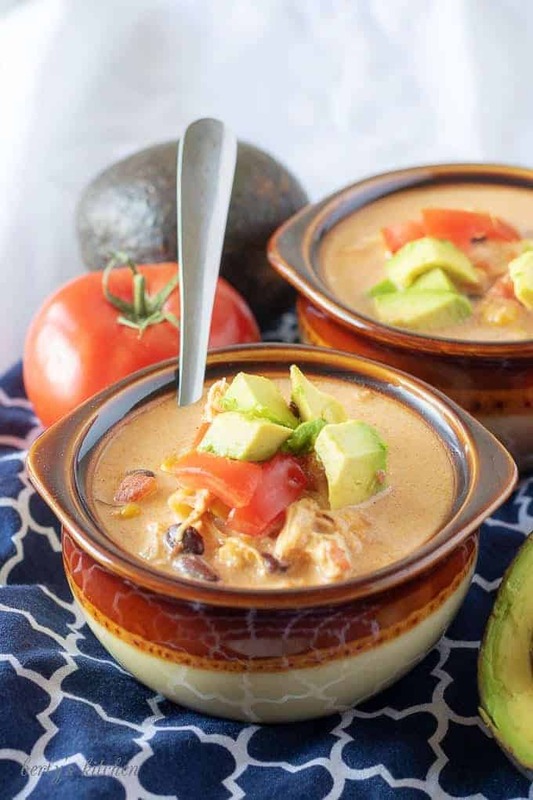 Garnish each soup bowl with your favorite toppings like sour cream, tortilla chips, avocados, cilantro, etc. Serve immediately. Store any leftovers in the refrigerator for up to 3 days. As I stated above, this can be done in a slow cooker or in a stock pot on your stove-top. Simply put in everything except the cream and cheese. For the slow cooker, let it cook on high for 2-4 hours, then let the soup cool for about an hour before stirring in the cream and cheese. Same thing for the stove-pot version; except, cook it over medium heat for about an hour and let it cool for 20 minutes before adding the cream and cheese. 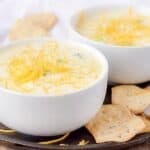 Either way, the soup needs to be hot enough to melt cheese but not boiling; otherwise, the cream will break. The chicken can be shredded in the slow cooker or stock pot using tongs. Feel free to use boneless, skinless chicken thighs or even canned chicken for an alternative version. You can substitute any cheese you desire and for an extra kick of spice, dice up to jalapenos or chiles and toss them in with other veggies. 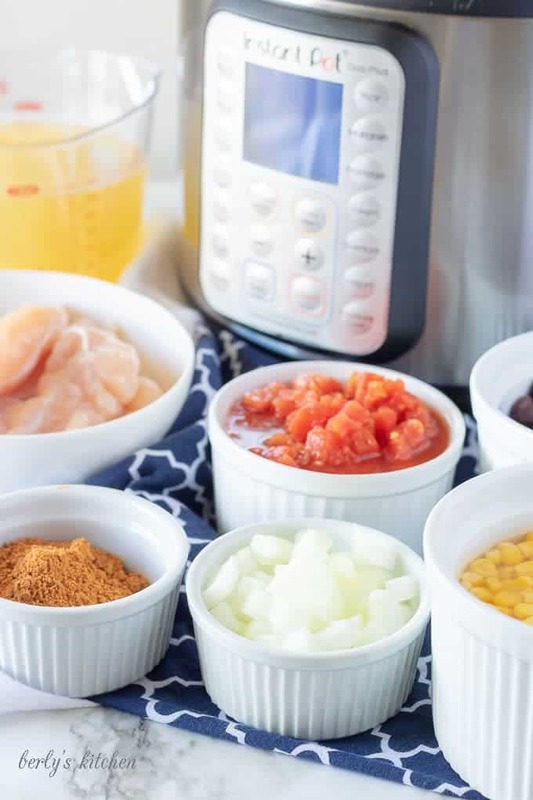 Looking for more Instant Pot ideas? 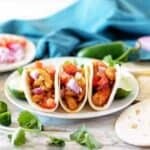 Then checkout our other recipes like, Instant Pot Chicken Soft Tacos or our Instant Pot Cheesy Hamburger Dip! 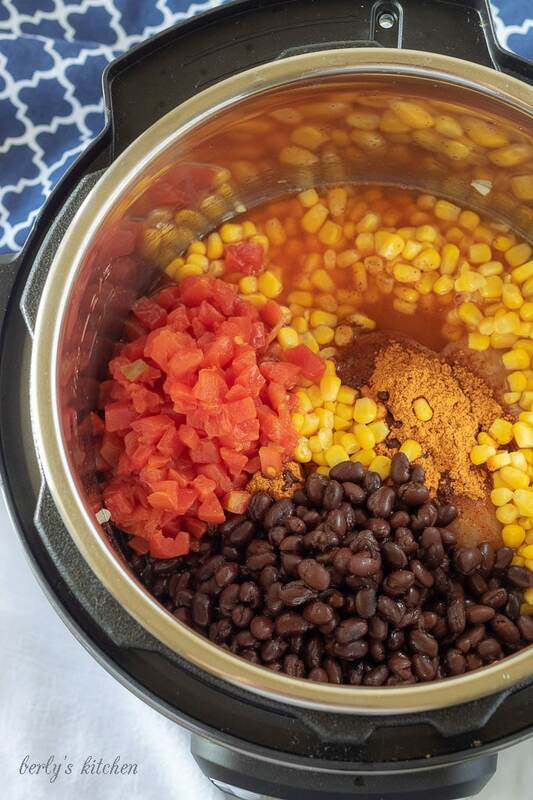 A flavorful Instant Pot chicken taco soup made with black beans, chicken breast, corn, garlic, onions, and cheddar cheese. It's perfect for Fiesta Fridays! Next, layer the chicken, taco seasoning, chicken broth, corn, beans, and tomatoes with green chiles. Then, close the lid, and set the Instant Pot to “Sealing.” Turn on the Instant Pot using the manual/pressure cook setting on high pressure for 7 minutes. After the 7 minutes is up, allow the Instant Pot to complete a natural release for 10 minutes and open the valve for a quick release of the remaining pressure. After that, remove the lid and take the chicken out of the Instant Pot. Use two forks and shred the chicken. Set aside. Afterwards, add the shredded cheese and stir until melted. Once the cheese is melted, place the shredded chicken back in the Instant Pot and stir. Last, garnish with your favorite toppings like sour cream, tortilla chips, avocados, cilantro, etc. Serve immediately. Store any leftovers in the refrigerator for up to 3 days. The calories listed are an approximation based on the ingredients and doesn't not include any garnishments. Actual calories will vary. The soup can be stored in your fridge in a sealed container for up to three days. Well we certainly LOVE tacos here. With the cold weather just around the corner, this recipe will come in handy for sure. I don’t have an instant pot…but I do have a pressure cooker. It will give it a shot. This looks so flavourful, hearty and comforting! Just what I want on a cooler fall day! I particularly love the generous heaping of avocado on top – YUM! OMG I love you! I just got an Instant Pot and I’ve been having so much fun trying new recipes. This soup is gonna happen ASAP. Appreciate a recipe that is easy, delicious, and fun. We don’t have an Instant Pot, but we have a slow cooker, Thanks for your tips! Sounds delicious, and pretty easy. I’ve learned our parents love those flavors (and we do, too!) so they’ll probably enjoy this! This soup looks so good! I could see myself snuggling up with a bowl of this in the cooler weather. This is a perfect weeknight meal! Aren’t Instant Pots a lifesaver for busy schedules? I’ll take tavcos however I can get them! Bonus points for the instant pot! I love how easy and full of flavor this recipe is. Perfect for fall. Oh this is soooo yummy. 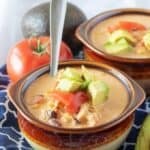 I love Chicken taco soup but never tried it in Instant-pot. I’m pinning the recipe to try soon. I love soups in the instant pot! It’s hard to believe it’s almost time for soup weather with how hot it’s been, but this will be perfect for fall! What a yummy soup!! Sadly I don’t own an instapot yet, however it is on the top of my Christmas list! This recipe looks delicious so as soon as I get one I will definitely have to try it! This looks marvelous! Could evaporated milk be used in place of the heavy cream? Anyone make this using frozen chicken breast?